The number of sanitary waste products being used around the globe is growing. Changes in consumer behavior and developments in Health & Safety legislation makes the supply and servicing of sanitary disposal units more necessary than ever. Blockages that increase the need for high-cost server maintenance. Environmental pollution with items such as sanitary towels, tampon applicators and plastic backing strips littering rivers and beaches. 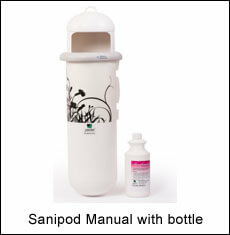 JADE assures for the best hygiene with perfect eco friendly solutions through its products. 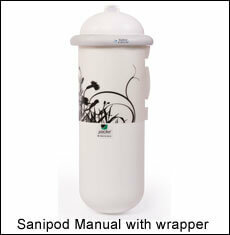 Fully automatic / manual coin based sanitary napkin vending machine. Accepts multiple denominations of Indian Rupee coins ( Rs.5.00 or Rs.10.00) in a single transaction upto the (customized) value of the sanitary pad within the machine. The spring and storage capacity of the machine is 35 single pads each. A LCD display Screen with Coin Slot and Take-Out Port with Flap is in the front of the machine in automatic version and on the right hand side in manual version. Auto lock-out feature when no pad in automatic version. SMS/Email alerts & notifications for refilling and machine status in automatic machine. 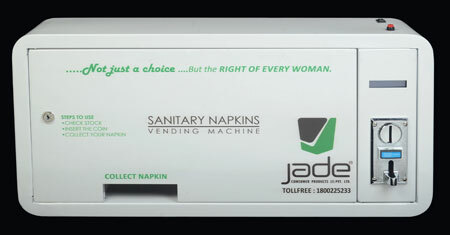 Leveraging the skills of our qualified team of professionals, we are instrumental in offering the highest & best in quality Coin Based Sanitary Napkin Vending Machine.